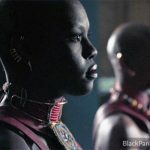 The Dora Milaje are Wakanda’s elite female royal warrior guard. 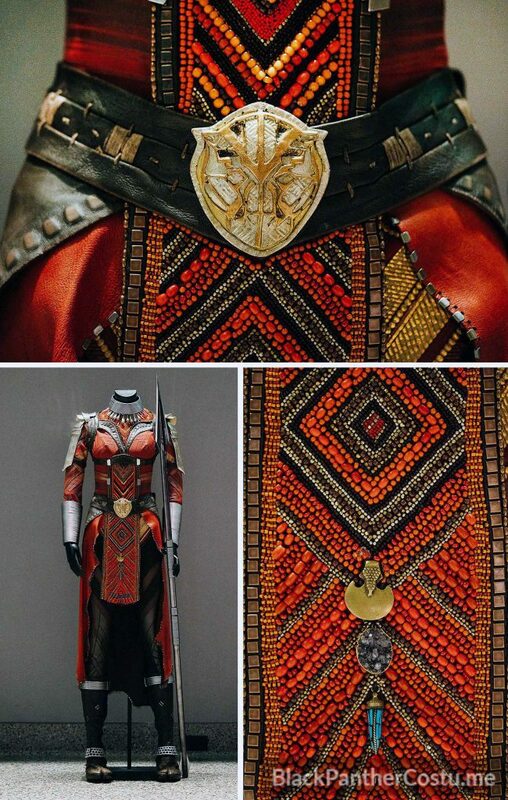 Okoye is the general – the leader – of the Dora Milaje, and as such, she wears unique items to set her apart. 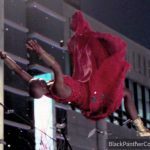 There were 8 total Dora Milaje in Black Panther. 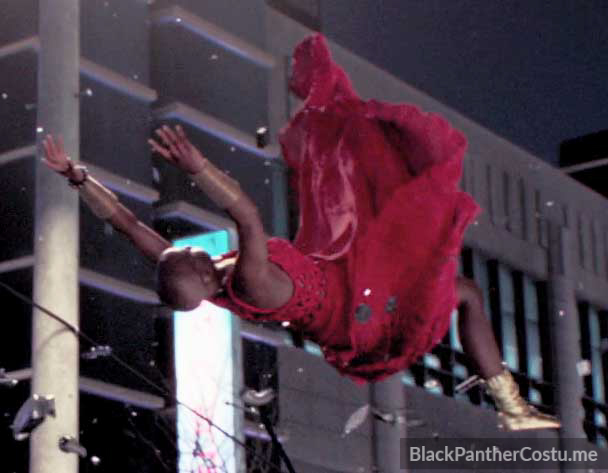 The body suit was likely made of the same 4-way stretch Euro jersey that the superhero suits were made of. 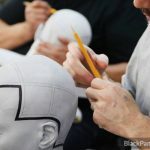 The suits appear to have been made in two parts (a leotard top and tights below), with various designs silk-screened onto them using stretchy, dimensional inks. Some of the triangular designs on the legs mirror the designs on T’Challa’s new suit in the Black Panther. 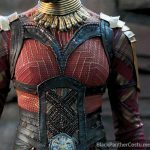 The necklines of the suits were decorated with intricate bead work (all inspired by Himba, Maasai & Turkana tribes of Africa). 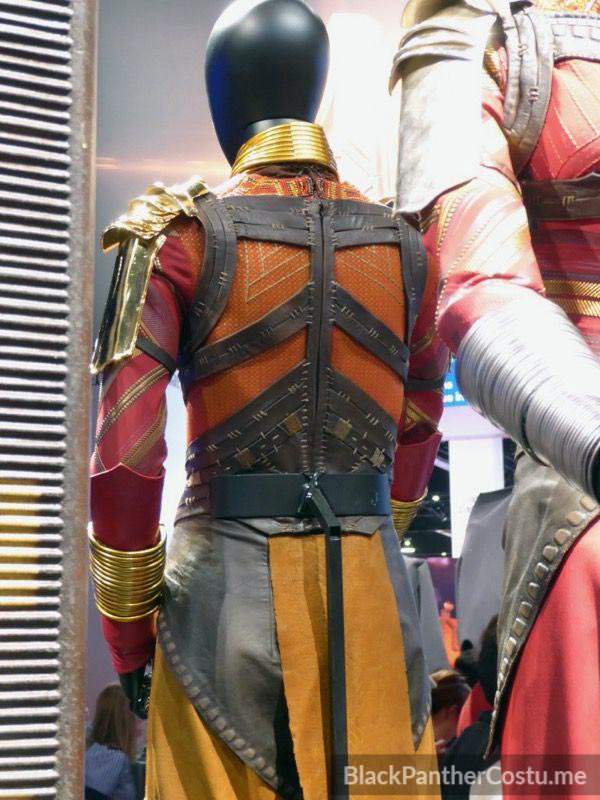 The suits zip up on the back, and appear to have had some Velcro panels to help secure the armor and bracelets in place. 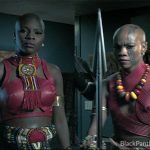 The leather harnesses were to look hand-tooled by the same craftsmen who made the Queen’s outfits (but were actually made by craftsmen in South Africa). 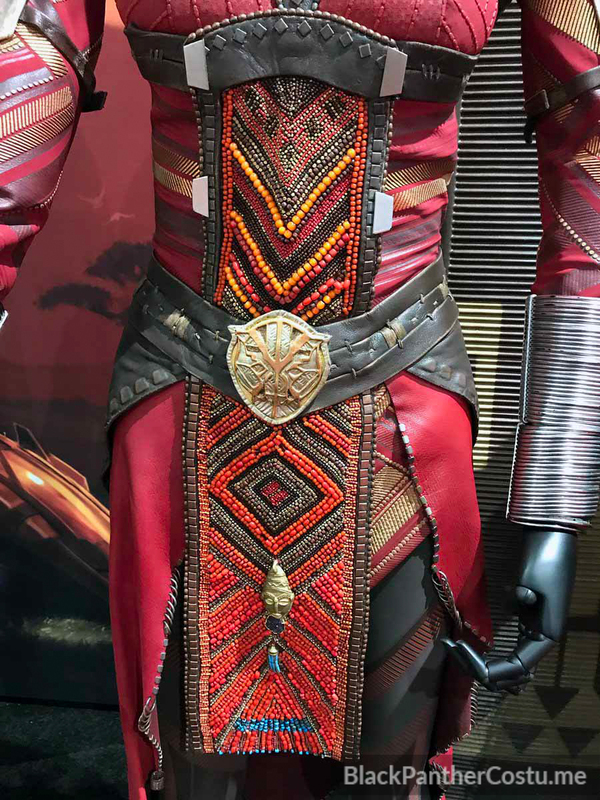 The harnesses appear to be made of multiple pieces of leather, stitched together with large decorative stitches, and decorated with various square studs, some of which appear to be under the leather. 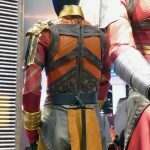 The harnesses covered the edges of the suit’s bead work and fastened on the back. 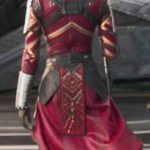 Okoye’s harness appears to fasten with a zipper, while the other harness form a simple X on the back, where they were fastened together. 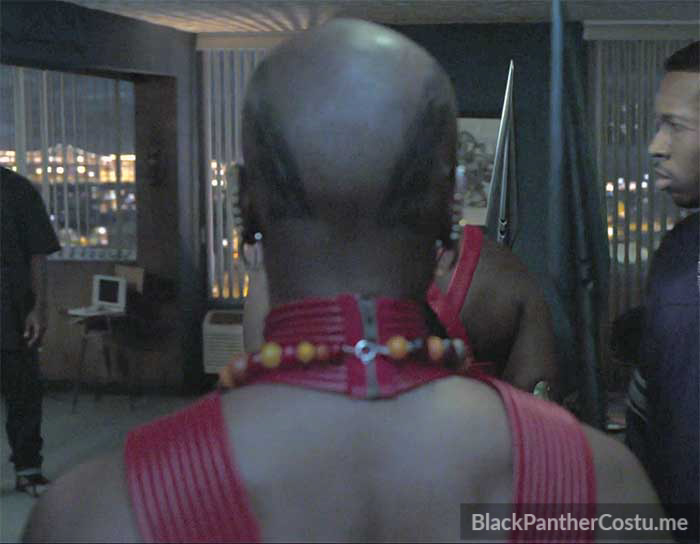 At hip level, the harnesses bore a buckle-type emblem, some in the shape of a panther’s head. 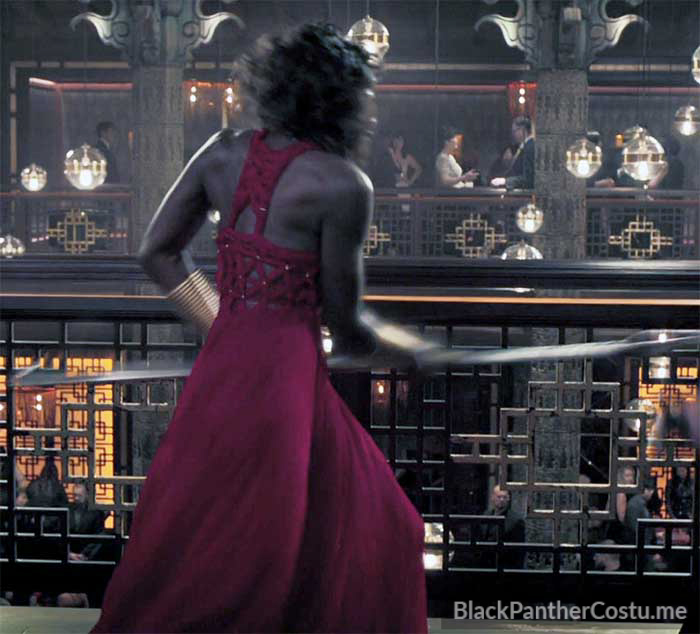 The harnesses have 2 coat-tail tassets covering the rear hips, except for Okoye, who has one larger triangular coat tail. 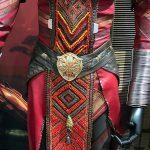 The most eye-catching parts of the harnesses are the tabards, which were decorated with intricate bead work and charms. The bead work was inspired by the Turkana tribe of Africa. 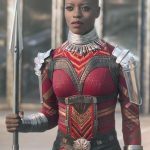 While most of the Dora Milaje have beaded rear tabards, Okoye instead has what looks like a simple suede leather tabard. 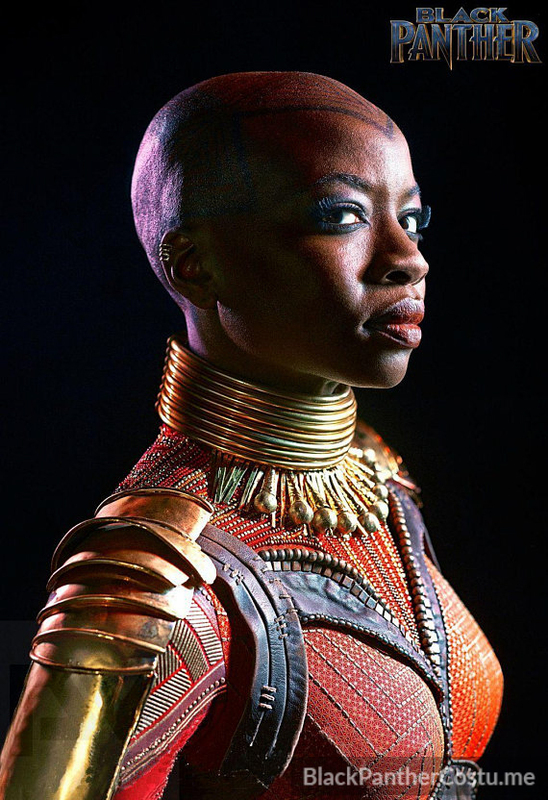 The Dora Milaje wore metallic laminar armor on their shoulders and upper arms. 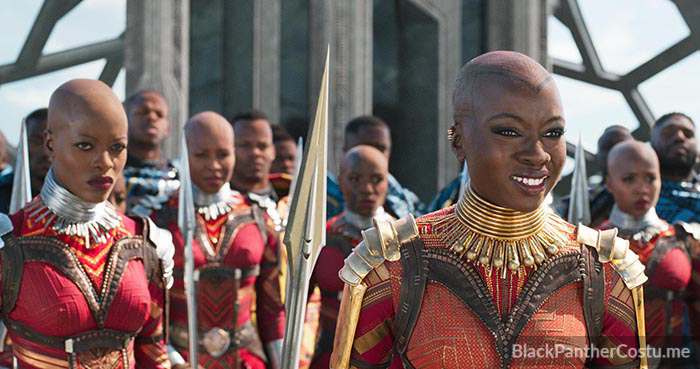 To signify her leadership role, Okoye wore gold armor, while the rest of the Dora Milaje wore silver. 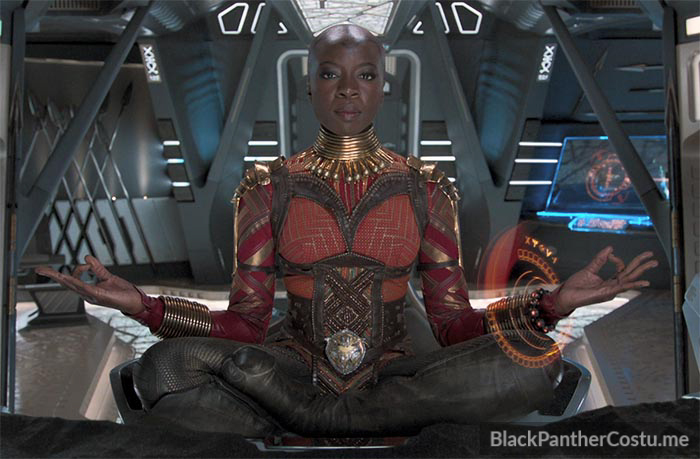 The armor, like seemingly any other metallic object in Wakanda, was supposed to be made of vibranium. 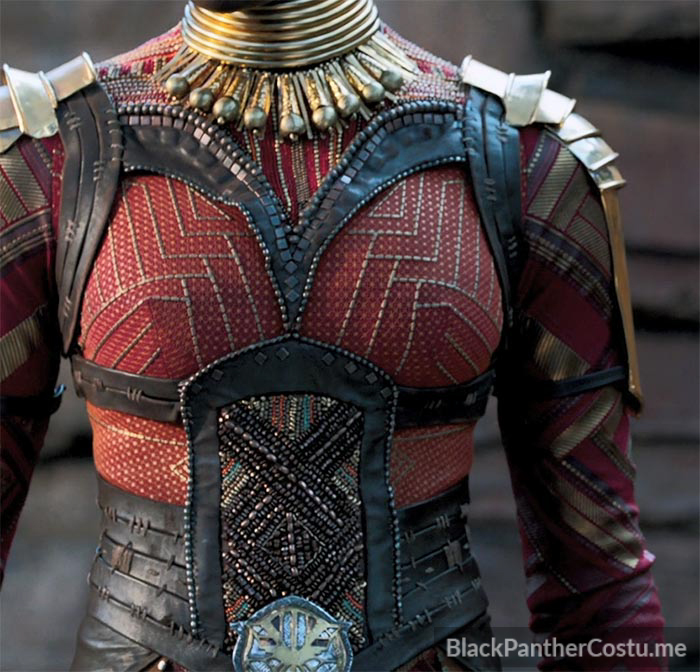 Director Ryan Coogler reportedly requested that the armor look like jewelry (check out the Black Panther’s jeweler’s website HERE). 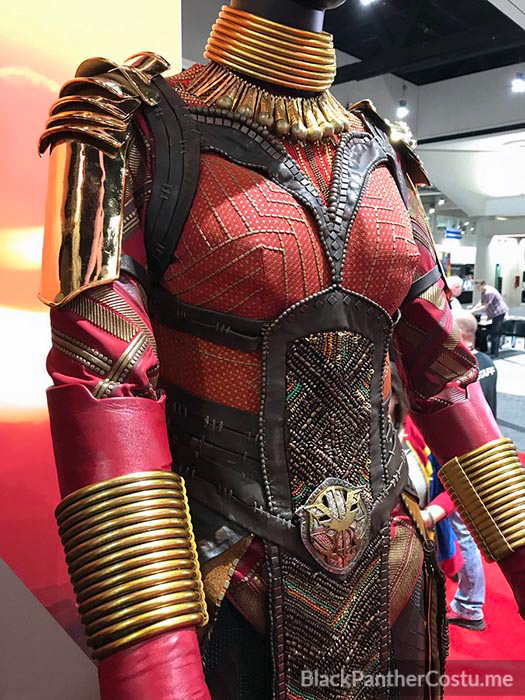 The armor attached to the harness at the top, and with leather bands around the arms. 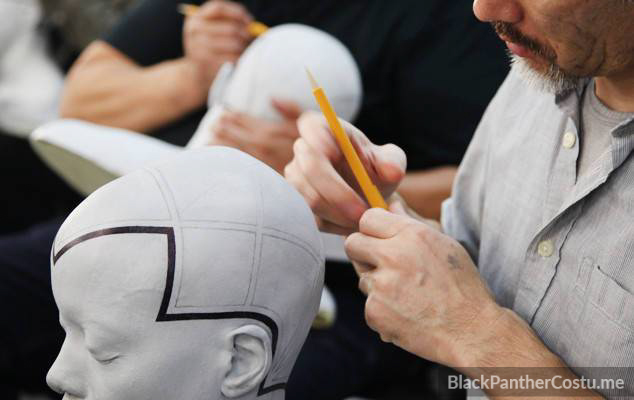 The uniform’s neck embellishments consisted of neck rings styled after the (Ndebele tribe from South Africa). 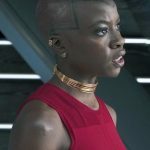 Okoye’s neck rings are golden and thicker (there are only 8 of them). A choker necklace with beads radiates from under the neck rings. 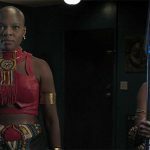 On most Dora Milaje, these beads were simply bars, while Okoye’s beads looked similar to upside-down ice cream cones (these special beads are likely a symbol of seniority). 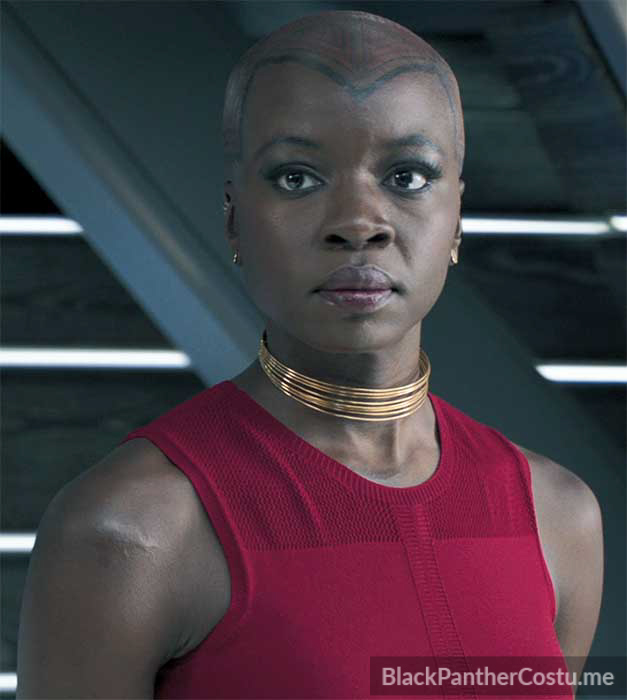 The Dora Milaje also had rings on their forearms. In some photos, it appears these were made in 2 sections. 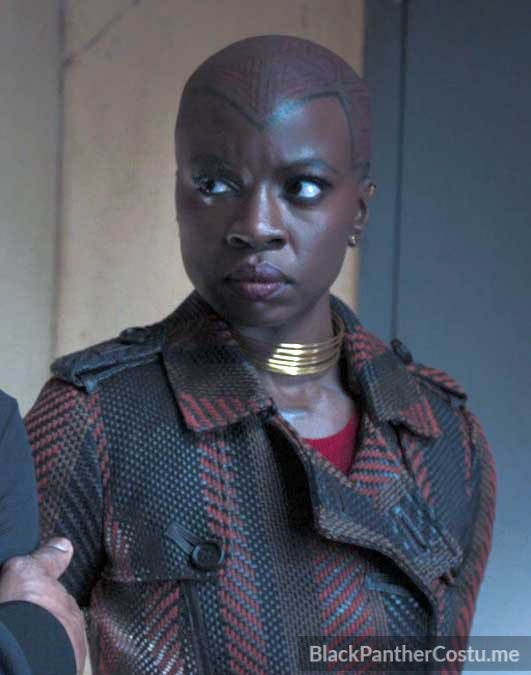 Okoye also wears leather forearm covers under her arm rings. 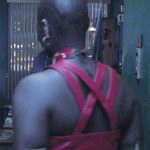 The neck and arm rings were fastened with Velcro. 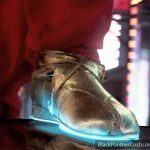 The Dora Milaje wear leather split-toe boots that have a few silver rings at the top, and some silver anklet decor at the bottom. 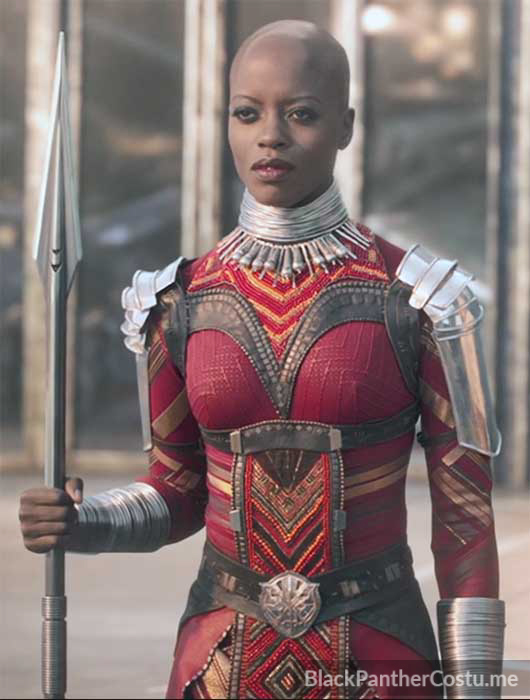 The boots come up to just below the knee on most Dora Milaje, but Okoye’s boots have additional leather over the front of the knee (and aren’t decorated with any metallic rings or anklets). 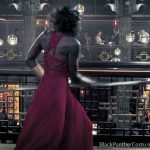 Each Dora Milaje wears a red leather waist cape that has metal rings and clips decorating the edges. 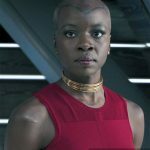 Okoye wears a suede cape that matches her tabard, which is a golden tan color. The shapes of the capes suggest they were leather hides that weren’t cut down to have straight edges. They wear an orange-red bandeau top that has a herringbone pattern. Our best guess is that elastic bands were sewn into the top and bottom of the bandeau, as opposed to the whole bandeau being made of elastic fabric. 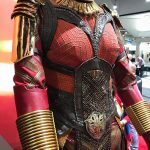 Okoye wears a beaded breastplate instead of the bandeau. Black, plain, high-waist, synthetic leggings with orange-red binding at the top. 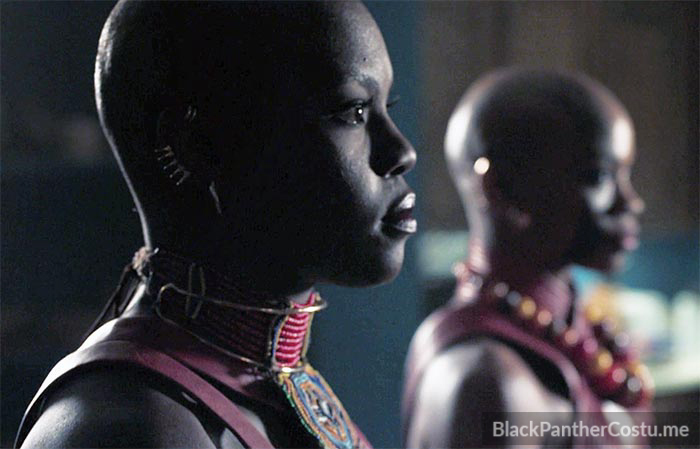 The Dora Milaje wear what appear to be their regular neck rings (with the exception of Okoye, whose breastplate also includes a beaded collar). 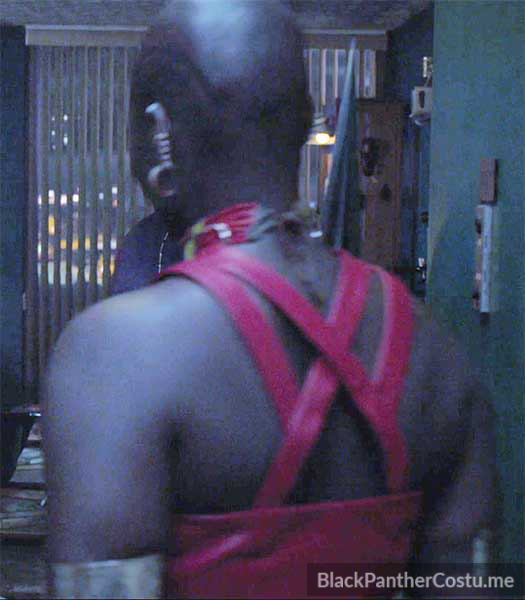 Beneath the neck rings are necklaces made of large, strung, cube-shaped red beads. A black belt with a sheath tied to the left thigh. 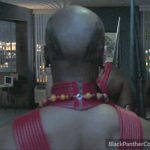 The whole belt and sheath are outlined with cowrie shells. 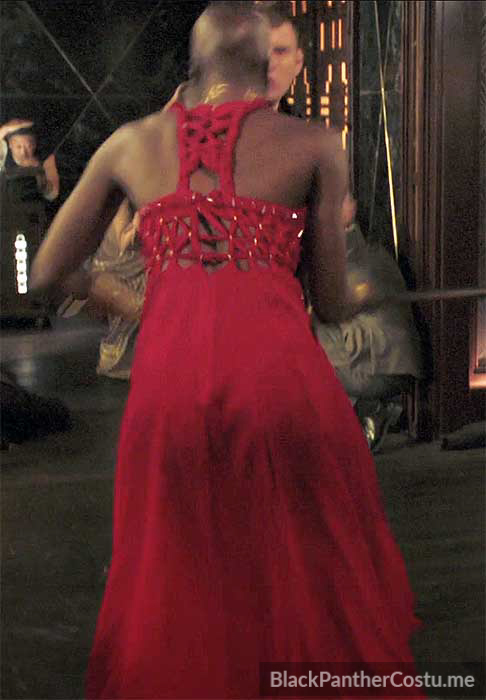 A meshy reddish sash appears to be attached to the belt and covers mostly the right hip. Colorful, festive anklets cover the bottom portion of the lower legs. 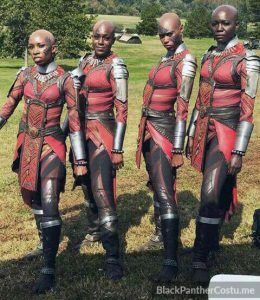 The Dora Milaje appear to wear leather sandals with these outfits. 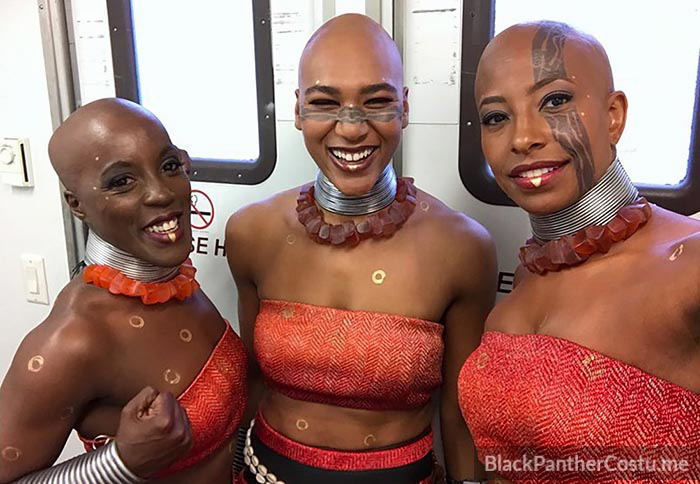 Several members of the Dora Milaje can be seen with head and/or face tattoos. 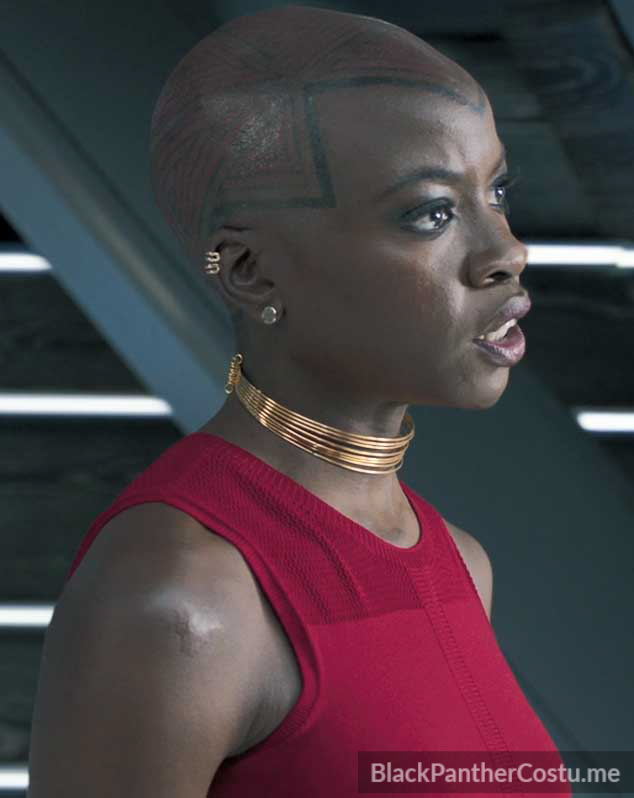 Okoye has a full-scalp tattoo to set her apart. 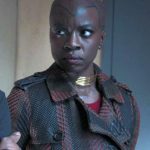 “She is the General of the Dora Milaje, so her tattoo was designed to look like a fighter pilot helmet,” he recalled of Danai Gurira‘s costume. 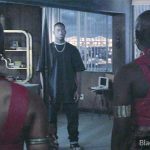 Yet, in Joel’s innovation-first mindset, it was necessary. 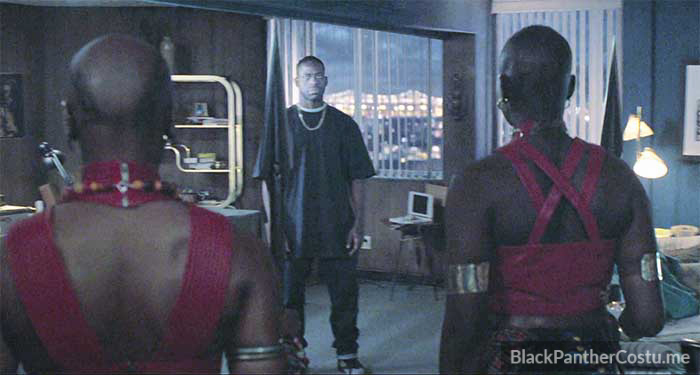 “We wanted to show that this is a civilization that’s far in advance of anything we’ve seen before,” he finished. 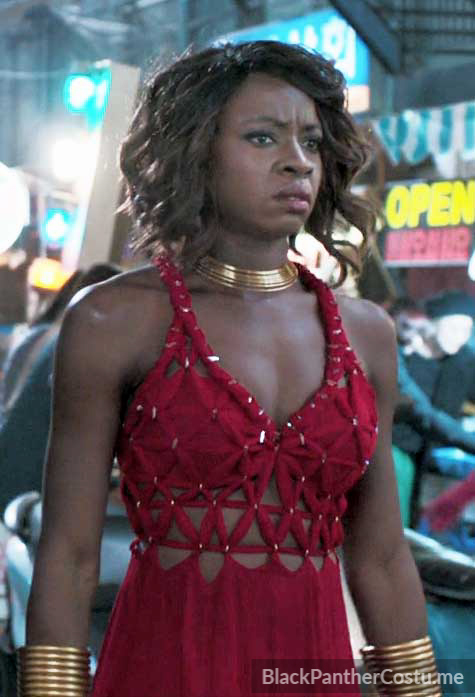 For the nighttime Busan scene, Okoye is disguised and wearing a wig, along with a red dress, gold jewelry and high-tech, metallic gold, split-toe boots. 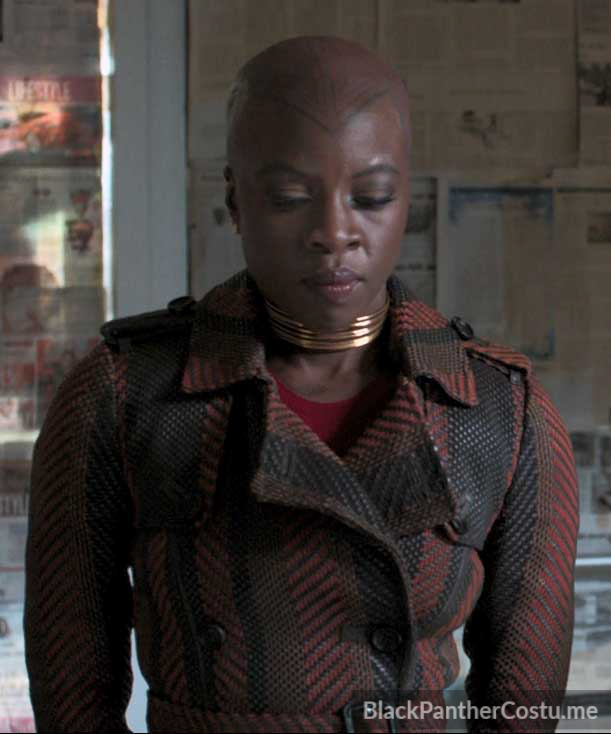 Okoye wears a Burberry leather woven trenchcoat. 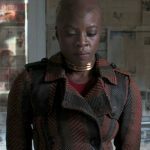 Costume designer Ruth Carter acquired the coat on eBay, as it was out-of-season. 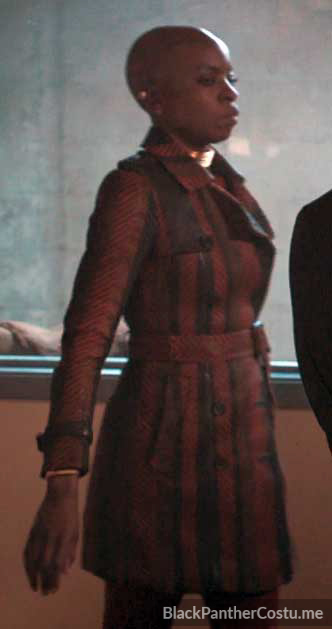 The costume department couldn’t find duplicates for the stunt team, so they photographed the coat and then printed the pattern onto fabric which was then made into replica coats. 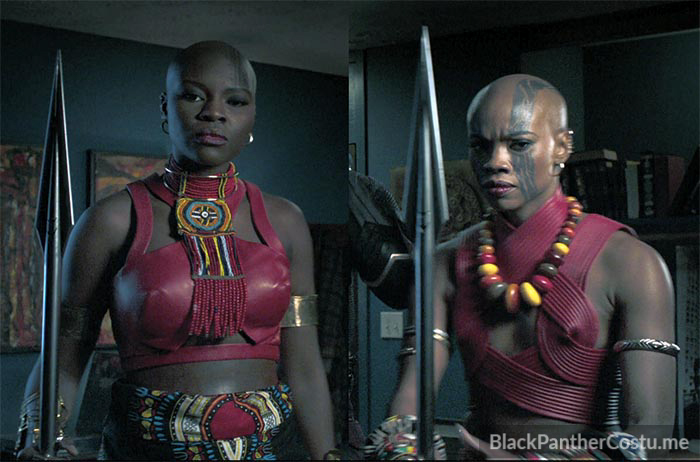 Two Dora Milaje arrive before King T’Chaka appears. 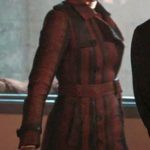 Their outfits appear fit for the time period and don’t seem to be very uniform or official.